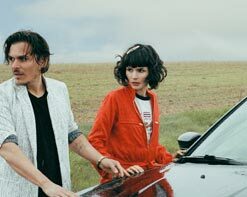 The Dø "Despair, Hangover & Ecstasy"
Powerful, intense, coherent. Shake, Shook, Shaken and the new single “Despair, Hangover & Ecstasy” is the very special odyssey of The Dø. Olivia Merilahti and Dan Levy always favored risk-taking rather than comfort and compromise. With this third album, the Franco-Finnish duo offers a radical change – a futuristic turn carried along by a syncopated electronic beat. After the wonderfully accidental and chart-topping A Mouthful (2008) and the organically experimental Both Ways Open Jaws (2011), Shake, Shook, Shaken responds with a new requirement elevated as “dogma” in the opinion of those concerned: Dan and Olivia deliberately opted out of acoustic instruments to focus on synthetic dance sounds and percussion. Olivia and Dan succeed in making music both cerebral and visceral, building bridges between the present and the future. Varied in its approach and essentially uncompromising, Shake, Shook, Shaken lays the foundation for unprecedented experimentation to conquer unexplored territories. Today, we present “Despair, Hangover & Ecstasy” for your consideration, a perfect representation and introduction to The Dø. “Despair, Hangover & Ecstasy” is a wildly entertaining clip that not exemplifies the energetic dynamic of Olivia and Dan but they’ve also picked a location that offers up a visual that is a first for any music video we’ve seen. Set at what may seem like a quiet country airport, the pair traverse across the tarmac, showing off their best dance and kung fu moves. Their interaction is natural and enjoyable to watch, whether they’re dancing, performing, or simply hamming it up for the camera. Oh, and did we mention that there is a Boeing 747 jet? That’s right, in this modest little airport sits this aeronautical behemoth and The Dø take full advantage of its size and imposing presence. Dancing in the engine housing and making this monster their playground creates a fast-paced and dynamic clip that compliments “Despair, Hangover & Ecstasy” to perfection. It is our distinct pleasure to bring this video to you and your viewers. With an infectious tune and stellar visuals this is one that is sure to wow programmers and viewers alike. We are here to help any way we can to get this into your programming, so please contact Andy Gesner and the HIP Video Promo crew at (732)-613-1779 or email us at info@HIPVideoPromo.com for more info on The Dø.